Latkes are a holiday classic. No matter what religion you practice, there’s no getting around the fact that latkes are golden, crispy deliciousness. While I’m a total sucker for comfort foods, a plate full of latkes is not exactly conducive to a happy, non-bloated tummy. I’m always on the hunt for ways that I can prepare holiday classics with cleaner, better-for-you ingredients. Hence, this recipe for our baked sweet potato latkes. Crispy latkes are possible – even when you’ve swapped a pan filled with oil for a parchment lined baking sheet. I’ve also swapped out regular potatoes for sweet potatoes. Sweet potatoes are low on the glycemic index, making them a smart alternative to their starchier counterpart. Sweet potatoes are packed with potassium, beta carotene, vitamin C and vitamin B6, as well as many other vitamins and minerals. The oats add an extra dose of fiber, and will leave you feeling full for longer – so you can dodge those post-meal cravings. Make these for the whole family, or make them into bite-size latkes for your little one. The best part is, they keep well in the fridge so if you’re looking for a snack for your little one that you can make ahead of time – this is a great option. You can even serve the bite-size version at a party and pair it with creamy horseradish sauce or an herbed feta dip. The possibilities are endless. L’khayim! 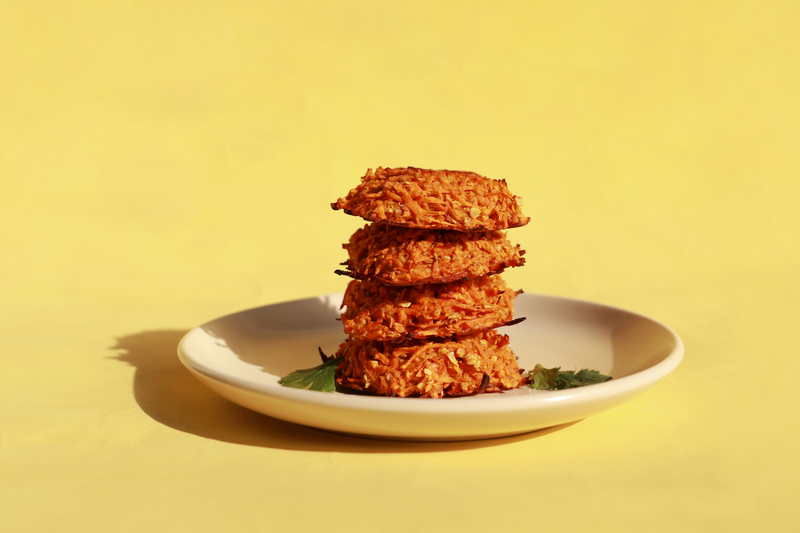 Crispy latkes - without all the oil and yucky stuff. Yep, we’re in. In a large bowl, combine shredded sweet potato and oats, and allow to sit for approximately 30 minutes, allowing the oats to soak up moisture from the shredded sweet potato. Add in egg, almond flour, minced onion, garlic, cumin, salt and pepper. Mix until well-combined. Preheat oven to 375F, and line a baking sheet with parchment paper. Using your hands, form small patties with the sweet potato mixture. Carefully place the formed patties on the parchment lined paper. Bake the latkes for approximately 15 minutes, then remove from oven, flip the latkes, and put them back in the oven to bake for another 5-7 minutes, until they’re crispy. These look so amazing! I will definitely be trying these this holiday season 🙂 Thanks for the recipe!